The complex of the two buildings consists of two luxury Cycladic architecture villas, that share large, comfortable, furnished terraces and a large, well kept garden. Located in Soros village. Α brand new elegant villa with minimalist design, in front of the sea, with pool, offers luxury, comfort and amazing sea views.Consists of 4 bedrooms, 4 bathrooms. Sleeps 11 people.The 3 level villa is 360 m2, in a land of 4240 m2, next to a sandy beach. Large super - luxury villa in Soros, just 100 meters away from Soros beach. The villa offers 5 bedrooms and can accommodate 10 people.On the first floor there are two large bedrooms, each with a double bed, air conditioning and ceiling fans, these two bedrooms share a bathroom, a large furnished veranda and a kitchenette. A medium size villa, located 120 meters away from the famous Soros beach on Antiparos.The villa offers three bedrooms (2 with double beds and 1 with two single beds), 3 bathrooms (one bathroom for each bedroom), a fully equipped kitchen, a large living room and a garden. An old wine press which has been transformed into a villa sits upon the beach on Antiparos, just 10 meters away from the sea.The main road that leads from the main town in Antiparos towards St Georgios passes right next to this villa. Located in the region of Soros on Antiparos island A beautiful villa 350m2, built upon a hill overlooking the Aegean sea and the surrounding islands.Consists of 5 bedrooms, 5 bathrooms Sleeps 10 people.The villa is built in Cycladic architecture, in 4000m2 gardens with 130 olive trees and many flowers. It is only 3 min walk far from the well known sandy beach ''Soros''. Located close to Antiparos town. A traditional Cycladic House uppon a hill with amazing sea view.Consists of 2 bedrooms, 2 bathrooms.sleeps 4 people.The House is 144m2, located upon a hill with panoramic sea view. On the ground floor it has an ensuite double bed bedroom with a bath tub bathroom, a second bedroom, a sitting room with a TV and a second bathroom with shower. The house is built on a 1000m2 plot with panoramic views over the bay of St.George, Despotiko and Sifnos island, it is 600 meters far from the beach and consists of a main house, a studio with one bedroom plus living room and an isolated bedroom with bathroom . All have their own entrance without internal communication. 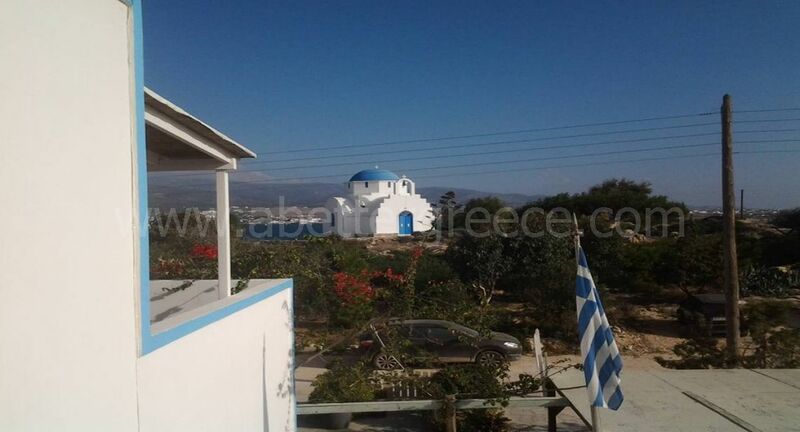 Located in Soros region of Antiparos island A traditional House upon a hill, by the sea, overlooking the surrounding islands and the Aegean sea.Consists of 4 bedrooms, 3 bathrooms.Sleeps 8 people.A 3 level House, upon a hill , by the sea and in front of a small beach.